Pulakesin-I in 543 AD took over the control of the town of Vatapi, the modern day Badami in the Bijapur District of Indian Republic and founded a dynasty named as Chalukyas, the etymology of which has different narratives attached to it - one goes with the birth of the clan getting its birth from ‘chaluka’ (palm) of Lord Brahma. The Chalukyas were defeated by the RashtraKutas around two centuries later until Tailapa II, a Chalukyan scion restored the family of his ancestors to its former glory & laid the foundations for the Chalukyas with their capital at Kalyani generally termed to as the Western Chalukyas. In the 10th century, Chavda dynasty was ruling the region of present day Northern Gujarat, who were supplanted by MulaRaja, another Chalukyan scion, possibly due to his relations with Samanta Sinha, the ruler of AnahilaPataka which is now known as Patan (in the northern Gujarat) - some sources suggests that he had adopted MulaRaja. MulaRaja established his capital at Patan in 940-41 AD which was already a fortified town till than developed by the prominent Chavda king Vanraj Chavda. 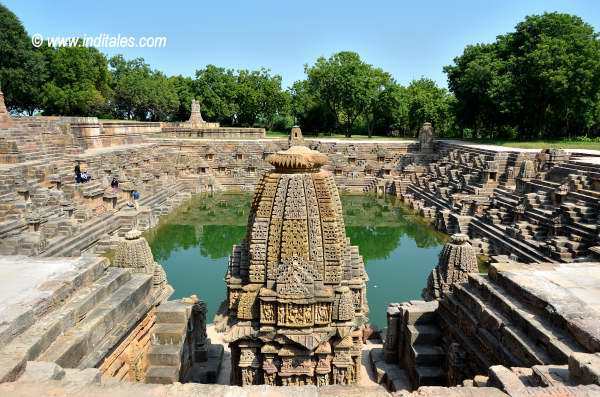 BhimaRaja succeeded MulaRaja who built the Sun Temple at Modhera which is now identified as the world heritage site. After his death, Rani ki Vav (a stepped well) was built by his wife & his son KarnaDeva who ascended the throne after him & defeated the Bhil chieftain of Ashavalli & established the city of KarnaVati - the city of Karna on the banks of river Sabarmati. His son Jayasimha later on added many architectural structures to the city as per a 12th century renowned writer Hemachandra who quoted about a lake built by his predecessor Durlabha which he renovated and named it Sahastralinga, literally meaning thousands of lingas (the symbol of Lord Shiva). Hemachandra says that it was not just a lake but also a great architectural beauty. 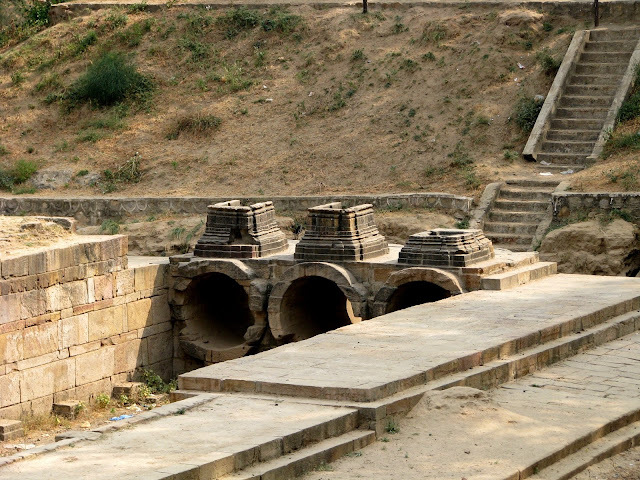 He diverted the flow of the entire Saraswati River into the lake. Many artificial islands were created on which many temples, palaces, and gardens were built. Apart from these, there were 108 temples to Devi, Yagnashala and Matha for pupils. The son of Jayasimha's daughter, Someshvara (the father of Prithviraj Chauhan, who later sat on the central throne of Delhi) was brought up by Jayasimha at the Chaulukyan court. JaySimha ruled for around half of the century till 1142 AD and Solankis continued their rule over the region until the 13th century when the Vaghelas of Dwarka overpowered them whose rule ended soon in 1299 when Zafar Khan, the governor of the central Delhi Sultanate took the opportunity to establish himself as sultan of an independent Gujarat in times when the central throne was getting weakened due to the sacking of Taimur & established Muzaffarid dynasty. 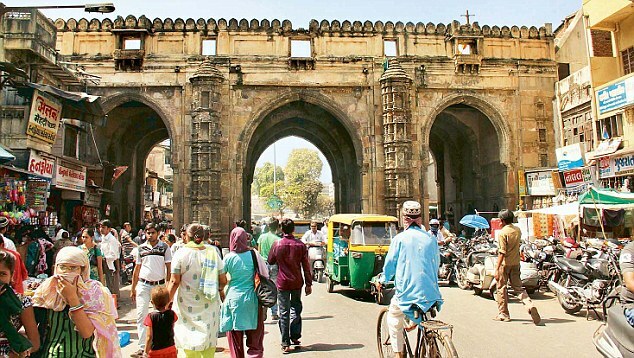 His son, Ahmed Shah developed his capital city at KarnaVati who destroyed many architectural structures as mentioned in the medieval literature & history, built and added new structures of a different school of architecture and renamed the city as Ahmedabad after his own name in 1487 AD. He built another city Ahmednagar which lies in the present day district of Saurashtra of the Indian state of Maharashtra. He fortified the city of Ahmedabad with an outer wall of 6 miles in circumference consisting of 12 gates, 189 bastions & over 6,000 battlements. Ahmedabad was ruled by the Muzaffarid dynasty until 1573 when Muzaffar II was the Sultan of Ahmedabad. Gujarat was then conquered by the Mughal emperor Akbar in 1573. During the Mughal reign, Ahmedabad became one of the Empire's thriving centres of trade, mainly in textiles, which were exported to as far as Europe. 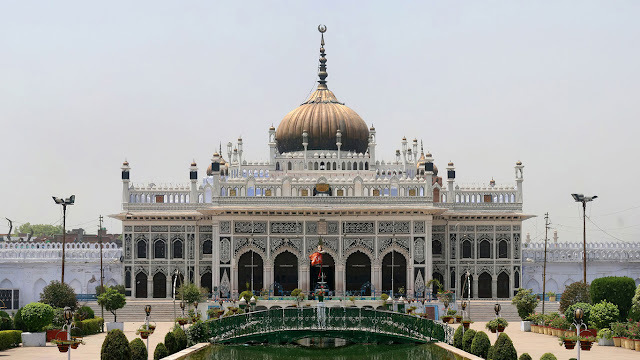 The Mughal ruler Shahjahan spent the prime of his life in the city, sponsoring the construction of the Moti Shahi Mahal in Shahibaug. A different layer of Mughal style was added to the city adding to its richness. The armies of the Maratha generals Raghunath Rao and Damaji Gaekwad captured the city and ended Mughal rule in Ahmedabad in the 17th century. The city was hence divided into two parts then - one each amongst the Peshwas and the Gaekwads. A famine in 1630 and the constant conflicts between the Peshwas and the Gaekwads virtually destroyed many parts of the city, causing its population to flee. The British East India Company took over the city in 1818 as a part of the conquest of India. A military cantonment was established in 1824 and a municipal government in 1858. The city took a major turn of its developmental story with the arrival of railways in 1864, when a railway link between Ahmedabad and Mumbai (then Bombay) was established by the Bombay, Baroda, and Central Indian Railways, making Ahmedabad an important junction in the traffic and trade between northern & southern India. The increased trade opportunities drove large number of people from rural areas to work in the city especially in the textile mills which eventually made it one of the most significant hubs of textile industry in India. 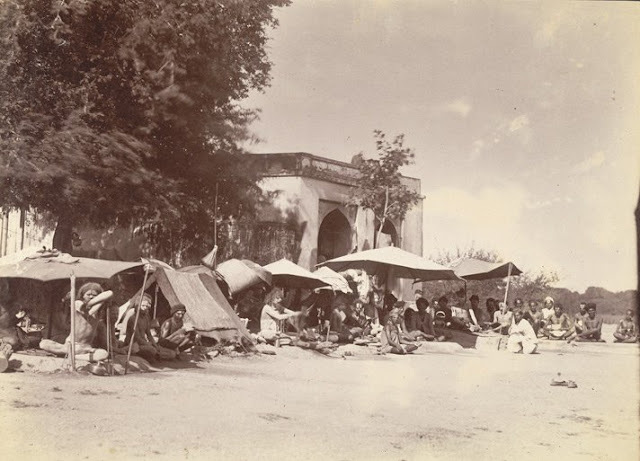 The 19th century saw the rise of Mahatma Gandhi and he built Ahmedabad as one of his base stations to fight the struggle for the independence of the country. 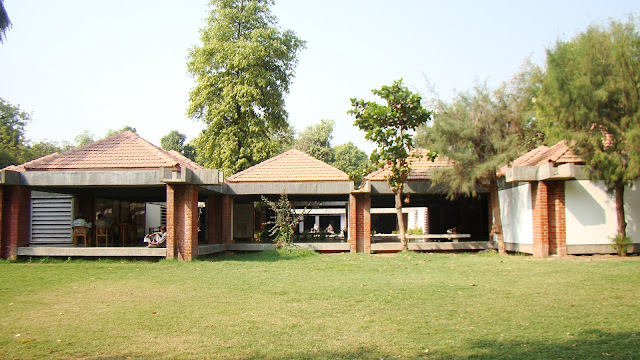 He established two Ashrams, the Kochrab Ashram near Paldi in 1915 and Satyagraha Ashram on the banks of Sabarmati in 1917. There are many instances of the city in the stories of freedom struggle thereafter including the famous Dandi March. 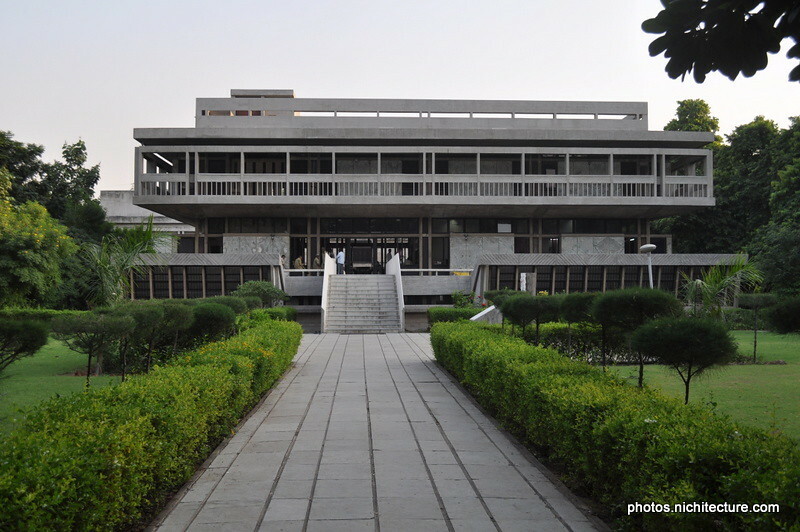 With the arrival of independence in 1947, Ahmedabad became part of the Bombay state of Indian Republic and with the bifurcation of the state in 1960 into Gujarat and Maharashtra, the city became the capital of the former one. The city has since than seen a healthy rate of development and has developed into the largest city of Gujarat both in terms of population and its share in the state’s economy. Around 40% of the dyestuff factories in India are located in Ahmedabad and pharmaceutical giants like Cadila and Zydus have their base in the city providing employment to the city’s population. The city’s share in the state’s economy was around 17% in 1995 which has substantially increased from thereon. The population of the city increased to 2.15 million in 1981 in the municipal area while being 2.65 million in its agglomeration reach. 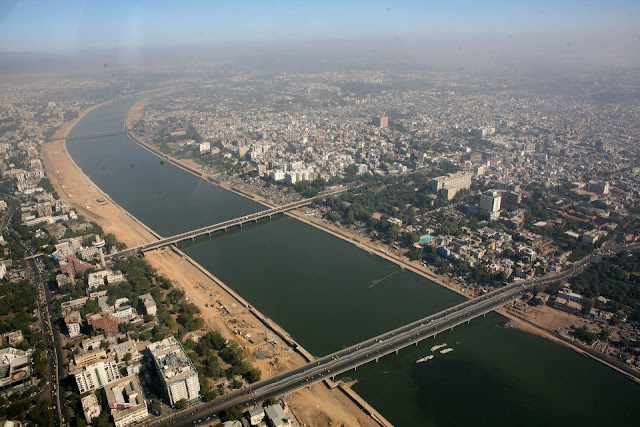 As per the census of 2011, the city population increased to over double since 1981 to 5.57 million in the Ahmedabad Municipal Area and 6.35 million in its agglomeration. 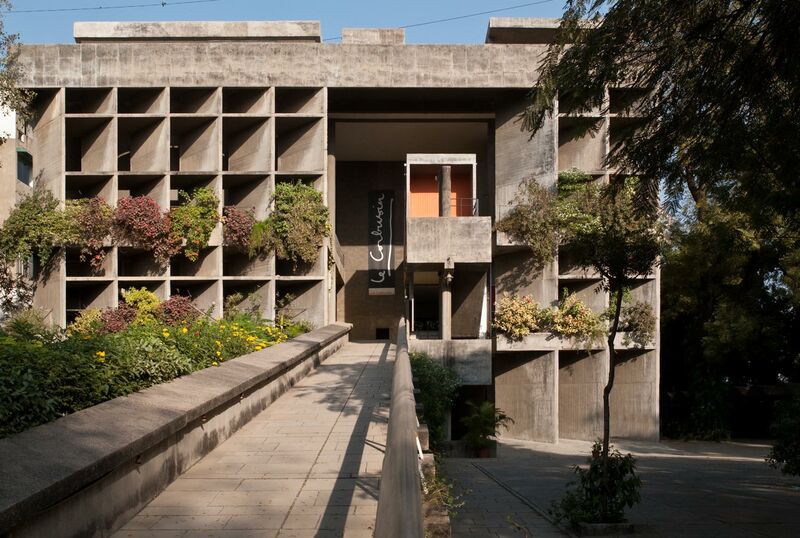 The Architecture of Ahmedabad is a retreat for the Art lovers especially those related with the field of Architecture and Planning with city providing an unique flavour of hybrid architecture ranging from the remains of the historic structures to the modern experiments of the 20th century by the Architects of the likes of Le Corbusier, Louis Kahn & BV Doshi engaging themselves in one of the most magnificent realisation of human creativity and application in relation with its shelter and natural relationship. 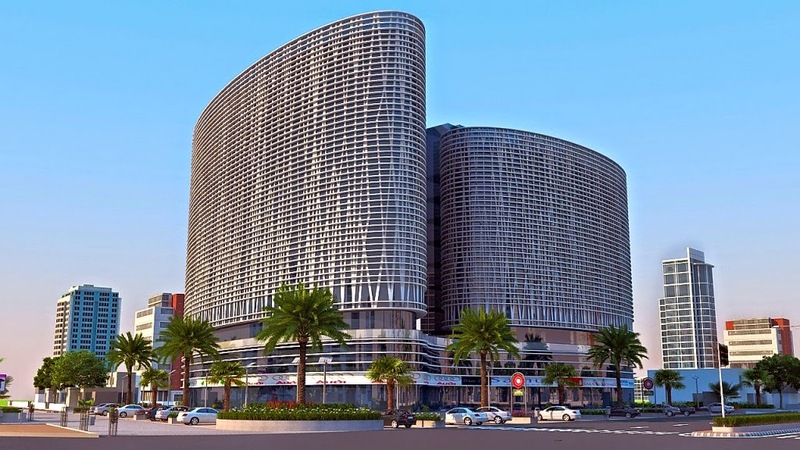 The modern architecture has been developed and planned keeping in mind the local natural makeup of the city in general which has provided the city with its unique character especially in terms of its prevailing architecture. Organised water supply in Ahmedabad started off in 1891 when Dudheshwar water works was established on the eastern banks of Sabarmati a piped water supply was provided to the residential localities. With the rise in population, the city experienced enormous pressures especially after 1960’s & the city started depending on the groundwater potential of itself which led to the rise of private groundwater boring which eventually led to the decline in the groundwater levels at the rate of 2 to 3 meter annually. The waste generated in the city is around 2100 tonnes per day which is rising with every moment passing by and for it city led the initiative called of by the Indian Supreme Court and started daily door-to-door collection of solid waste in 700 thousand households which constitutes around 80% of the total households of the city. The city faces an intense issue of its ever increasing vehicular consumption - the city added nearly double the vehicles against the number of human beings added to the geographical boundaries of the city from 2001-2011. The total number of vehicles in the city were around 14 lakh in 2001 which doubled itself to around 28 lakh in 2011 making the vehicular rate of addition of 100% while the population growth for the same time frame was 58%. 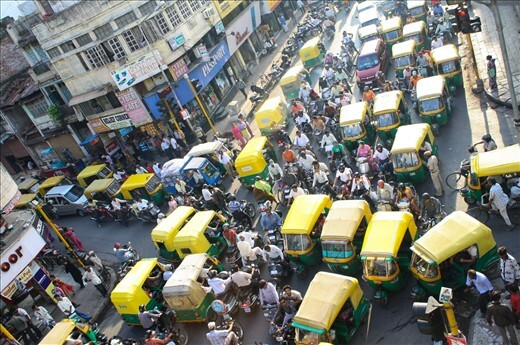 Every second person of the city holds a vehicle of his own making it one of the rank holders in terms of vehicular consumption per person amongst the Indian cities. A 60 km long Bus Rapid Transit system was developed to enhance the usage of public transportation system in 2008. The city is an example for depicting the significances of its history and its role in building its development story as can be seen in the case of Ahmedabad with its textile industry & climate responsive architecture - may it be the construction of the historic stepped wells or the establishment of modern buildings like IIM Ahmedabad and Institute of Indology which eventually has provided the inhabitants with a sense of belongingness and comfort both in their private shelter and the collective & shared one. The city blends harmoniously its historic heritage with its vibrant and dynamic present and for a similar reason it was inscribed in the list of World Heritage Sites of UNESCO under the title 'Historic City of Ahmedabad' in July 2017 becoming the first Indian city to get a name in it. Some other names in that list are that of Paris, Cairo, Damascus, etc,. The city presents an example that how a city can be built brick by brick while giving reverence to its locality & past & a vision for the future. The city faces many issues however which are in the directions of increasing over the period of time and their management shall be looked into through a more cohesive and inter-disciplinary perspective of human settlements in order to provide continuity and increase its life span while also increasing the quality of life of its citizens further.